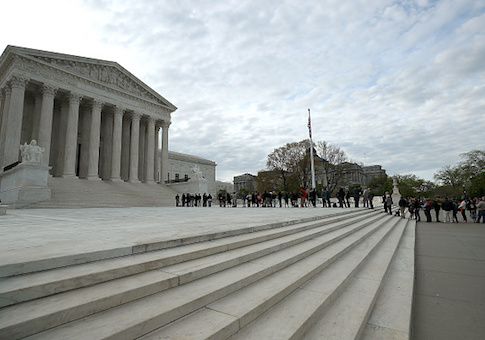 The Supreme Court has granted a stay to block abortion clinic safety measures adopted by Louisiana from going into effect. On Thursday evening the high court ruled 5-4, with Chief Justice John Roberts joining four liberal justices, to accept a petition from Louisiana abortionists to prevent the law from taking effect as the case is litigated. The 2014 law mandates that abortion clinics have admitting privileges to hospitals within 30 miles and adopted other patient protection measures. The clinic appealed to the Supreme Court after the 5th Circuit Court of Appeals ruled that it had not adequately demonstrated that the law would hinder abortion access. Justice Brett Kavanaugh, Trump's newly confirmed Supreme Court justice, wrote the dissent, saying that the majority should wait until Louisiana completes a 45-day regulatory transition period. Lawmakers have defended the law, saying that one abortionist has already obtained hospital admitting privileges. Plaintiffs, however, have argued that two of the state's three clinics would close if the law took effect. Kavanaugh said the Supreme Court should wait and see how the law plays out in the real world before granting such an injunction. "The case largely turns on the intensely factual question whether the three doctors—Doe 2, Doe 5, and Doe 6—can obtain admitting privileges," Kavanaugh said in a written dissent. "If we denied the stay, that question could be readily and quickly answered without disturbing the status quo or causing harm to the parties or the affected women, and without this Court's further involvement at this time." Kavanaugh said the doctors would continue to be allowed to perform abortions during the 45-day period and would be given leeway by regulators to comply with the law. He said those doctors would need to make a "good faith effort" to demonstrate that the law hinders abortion access. He said the majority would unnecessarily delay the case based on hypotheticals. "That will take far longer and be no more beneficial than the approach suggested here," he said. The case comes in the wake of the Supreme Court's 2016 decision to strike down similar safety measures in Texas. The 5-3 decision, with Justice Anthony Kennedy joining the Court's liberal bloc, ruled in Whole Women's Health that abortion reforms could not create an "undue burden on abortion access." The Court has changed since the case as Trump has appointed Justice Neil Gorsuch to replace the late-Antonin Scalia and Brett Kavanaugh to fill the seat of Kennedy, who retired in June. Pro-life groups were critical of the majority. Marjorie Dannenfelser, president of the Susan B. Anthony List, said the stay continued "a disappointing trend of avoiding their responsibility on decisions concerning abortion." She urged the Court to take up the case in full in order to review the factual evidence of such safety reforms. "Louisiana legislators on both sides of the aisle enacted this law to protect women from the abortion lobby which repeatedly puts profit over health and safety standards, and has proven incapable of policing itself," she said in a statement. "The Court should not prevent state legislators from doing the job they were elected by their constituents to do." The order is only temporary, as the plaintiffs in the case file an appeal to the Supreme Court to hear the merits of their challenge. If the Court decides not to take up the case, the measure would go into full effect. This entry was posted in Issues and tagged Abortion, Supreme Court. Bookmark the permalink.